This is a much lighter color than raw granular rutile (because it is ground to minus 325 mesh and calcined). It is the recommended type for use in ceramic glazes since it will not produce gases of decomposition. See Rutile topic for much more information. The theoretical chemistry is TiO2, but of course no mineral deposit has this. 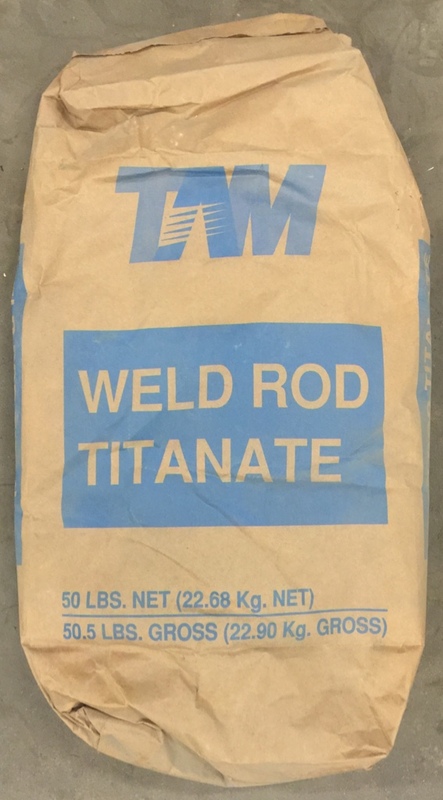 We have shown the chemistry of a commercial material whose original container bags are labelled "Weld Rod Titanate" (used in making welding rods). Rutile variegates glaze surfaces. But it also opacifies at higher percentages. The blue effect is a product of crystallization that occurs during cooling, it is thus dependent on a slower cooling cycle, especially above 1400F. 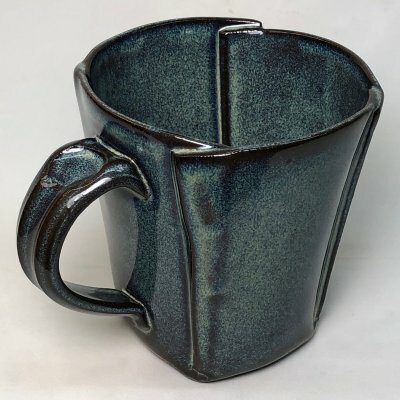 This is GA6-C Alberta Slip glaze with 4, 5 and 6% rutile. At 6% the rutile crystallization has advanced to the point of completely opacifying the glaze. At 5% the blue is still strong, even on a buff burning body. The loss of color occurs suddenly, somewhere between 5 and 6 percent. Rutile chemistry varies from batch to batch. The blue develops differently on different bodies. So do you want to play "at the edge", with 5% in the glaze, in view of these other factors and the finicky firing curve needed. Change in any of which could push it into the blueless zone? 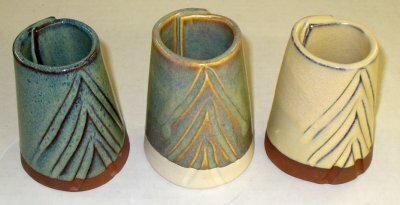 The glaze is a dolomite matte fired to cone 10R. High fire reduction is among the best processes to exploit the variegating magic of rutile. How much rutile can a glaze take before it becomes unstable? The 80:20 base Alberta slip base becomes oatmeal when over saturated with rutile or titanium (left:6% rutile, 3% titanium; right:4% rutile, 2% titanium right). That oatmeal effect is actually the excess titanium crystallizing out of solution in the melt as the kiln cools. Although the visual effects can be interesting, the micro-crystalline surface is often susceptible to cutlery marking and leaching. This is because the crystals are not as stable or durable as the glass of the glaze. The primary use of this material is obvious. It is not ceramics. But this bag is marked at "ceramic grade", likely a reference to its fine particle size. This bag is very small, ceramic rutile is very dense. 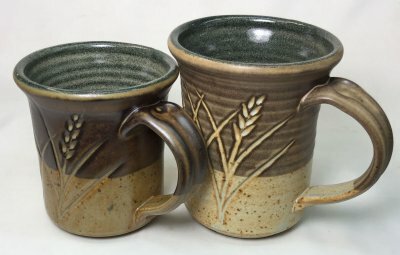 These mugs are Plainsman H450. Both have a black engobe (L3954N) applied to the insides and half way down the outside during leather hard stage (the insides are glazed with Ravenscrag silky matte and G1947U over the black engobe). 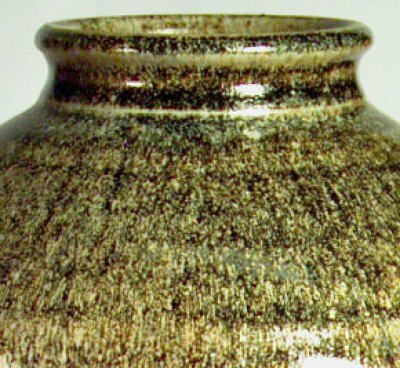 The bamboo glazes can thus be seen over the black (upper half) and the raw buff body (lower). 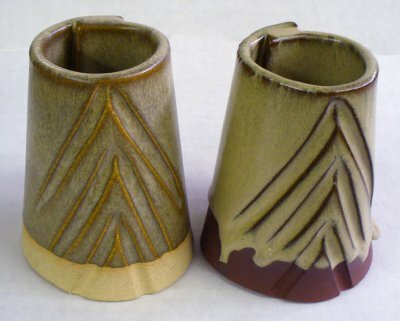 The bamboo glaze on the left has 1% iron added to the base G2571A recipe. The one on the right has 3.5% powdered rutile and 10% zircopax added. Glaze is GA6-C Alberta Slip rutile blue. Fired at cone 6. "Mother Nature's porcelain" has 6% Mason 6600 black stain. Possible to grind your own ceramic grade rutile? Yes, the granular and powdered grades are the same material. But grinding it is very difficult. Commercial ceramic grade powder is minus 325 mesh, the companies doing this obviously have very good grinding equipment. They also have patience because even in this efficient porcelain ball mill, 90 minutes was only enough to get 50% to minus 325 mesh! The color of the powder is a good indication of its quality, the finer the grind the lighter will be the tan coloration. 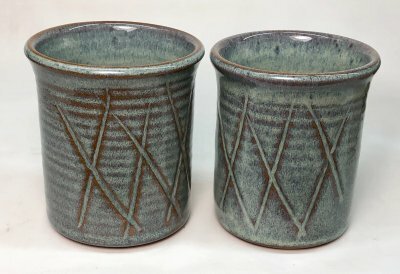 Left: GA6-C rutile blue glaze on a brown stoneware. 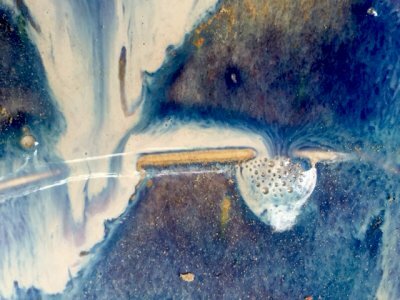 The 4% ceramic rutile powder gives the blue variegated effect. 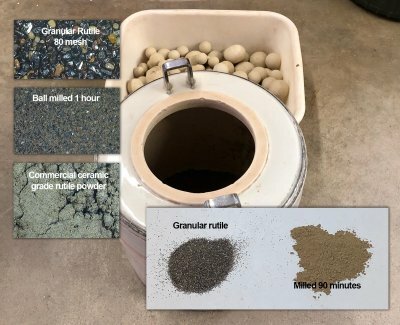 Right: We ball-milled our granular rutile and then screened it down to 325 mesh and put that into the same glaze. The results are the same. So if any of your rutile glazes ever lose this effect with a new supply of the material the cause could be that it has not been milled sufficiently fine. Finer rutile powders are browner in color.